Chandor struck gold directing (and casting Oscar Issac in) A Most Violent Year, one of the very best films of 2014, and boy were there a lot of great films in 2014: Birdman, Boyhood, Selma, The Grand Budapest Hotel, The Theory of Everything, Whiplash, Foxcatcher, American Sniper, Noah, The Imitation Game, The Babadook, Still Alice, Wild, Two Days One Night, Into the Woods, Interstellar, Guardians of the Galaxy, Dawn of the Planet of the Apes, X-Men: Days of Future Past, Neighbors, Big Hero 6, The Boxtrolls, Paddington, The Lego Movie, John Wick, Edge of Tomorrow, Fury. Wow, that’s some list, and of the few which really haven’t stayed in our collective memories very long, I think A Most Violent Year is the best, and definitely deserving of our remembering. Chandor follows up on that success about four years later, and although the result isn’t quite as strong, I’m glad this guy is back to making movies. Five ex-soldiers and lasting friends come together for one last mission, but this time they aren’t wearing flags on their shoulders. Santiago, the mastermind, has been working south of the border, trying to catch a criminal overlord named Lorea. With the help of an informant, he has finally tracked him down, and he knows that Lorea is hording cash in a jungle fortress, surrounded by guards but miles away from anything. The plan; use special ops tactics to infiltrate the house, steal the money, make a getaway, and live the rest of life without a care in the world. The team: Santiago the glue, Tom the planner, Francisco the pilot, and a pair of brothers named Bill & Ben who are about as solid in a pinch as they come. But you know what they say about best-laid plans, and the U.S. of A. isn’t flying in reinforcements to cover their asses, these soldiers are on their own. I respect Chandor, this team of actors is an action-epic match made in heaven, and there are grand points being made here about loyalty, service, paybacks, and broken dreams. 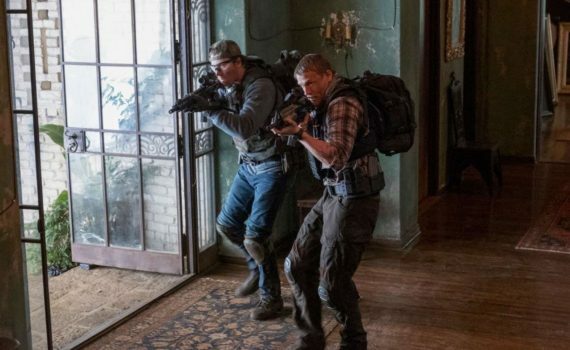 There’s a lot to take in, and a lot of screen time to fight over, but for a Netflix original that you go in expecting to be entertained by, Triple Frontier does its job, and also could have been much, much worse. That’s not to say there weren’t problems. The writing was pretty bad, the plot was jerky and at times felt like a skit instead of a film, the characters weren’t fleshed out in any way whatsoever. Audiences get thrown in, it’s a hell of a right, some of it is pure adrenaline, but sometimes the feel is just off, leading to a roller coaster instead of a direct flight to quality. I love Isaaac, Hunnam & Hedlund are underrated, and the brotherhood worked, I just think the writing was no friend to the story, and everything could have been tightened up over time, had some more energy been put in to making this film better, not released faster.